"Good boutique hotel. Close to Upper East Side. Great location." "Great location." Central location with great sightseeing, dining out and shopping. Decent, but pricey, parking. Adequate access to public transport. Good accessibility by car. Train station is close. "Professional, friendly service, especially at the bar." Poor management, but okay housekeeping. Booking process is sufficient. Room service could have been improved. "Medium sized, clean rooms with lovely views and comfortable beds." Small rooms and poorly cleaned bathrooms. Inadequate minibars in older, poorly-maintained rooms. Substandard furniture, A/C, TV's and kitchenettes. Shower can be a problem. "Standard bar. Alcoholic drinks are not the best. Good bar service." "Room size and comfort are OK, but beds are great." Small bathrooms, noisy rooms, and deficient A/C. "Facilities and entrance area are okay. Elevator in need of updating." Beautiful architecture. Good handicap accessible facilities. "Food and menu are not highly reviewed. Great snacks and desserts." Food is a bit overpriced. "Bathrooms are not up to standard, and rooms are lacking in maintenance, but of average size." Clean rooms with wonderful beds and stunning views. "Good restaurants & bars in the area. Good accessibility by car." Rated 71/100 based on reviews from business travelers. "Decent rooms with great views. Rooms need regular maintenance." "Great location. Adequate access to public transport." "Rooms are decently sized and clean enough, but bathrooms are low rated." Excellent beds and great views. "Great location." Central location with great sightseeing, dining out and shopping. Decent, but pricey, parking. Good accessibility by car. Adequate access to public transport. Train station is close. "Professional, friendly service, especially at the bar." Housekeeping and management are lacking. Booking process is sufficient. Room service could have been improved. "Standard bar. Good bar service. Alcoholic drinks are not the best." "Okay buildings and entrance area. Elevator in need of updating." Beautiful architecture. Good handicap accessible facilities. Rated 65/100 based on reviews from business travelers. "Rooms need regular maintenance. Great view." "Average sized rooms with great views and comfortable beds." Guests complain about bathrooms, A/C, and outdated rooms. "Decent vibe. Hotel could use some updating. Entrance area is ok."
"Average sized rooms with great views and comfortable beds." We stay at this hotel often. My husband is treated at MSKCC. the hotel is ideally located only blocks away from major medical centers. The parking is very reasonable and right around the corner from the Bentley. The staff is friendly and helpful. The rooms are clean and comfortable. The views from the upper floors are spectacular. Thank you for taking the time to rate and review your recent stay with us. We are delighted that you enjoyed your stay and found our staff friend and helpful. We are looking forward to welcoming you back soon. Do wish your husband a speedy recovery. Mice hotel. We visited for access to Sloan Kettering for our young daughter. Scale of 1-10 staff friendliness was s 6 at best. No onsite dining option. Reyes far far far less expensive online. Thank you. Thank you for your feedback. I will personally look into this. We look forward to welcoming you back soon. Please do not hesitate to contact me directly if I may be of any assistance in the future. Check in was fast and easy, we were offered help with our bags, room was very clean, breakfast attendant was very nice and helpful, bartender at the lobby bar was excellent, check was fast and simple. Value was great for the price we paid for a Friday night. Definitely would return! Thank you for taking the time to rate and review your recent stay. We appreciate your feedback about our friendly and helpful staff. Our river/bridge view rooms are breathtaking. We are glad you enjoyed your stay. Thank you for taking the time to review your recent stay with us. We are glad that the distance to the hospital was to your advantage. I will make sure Jonathan is aware of your kind comment. We wish you a speedy recovery and hope to welcome you back in the near future. No AC in New York City? No AC on a warm day. Didn't sleep well. Hotel couldn't fix the AC unit and told us other rooms might be hotter. They brought us a wimpy fan after two calls to the front desk. Called manager next day and never received a return call. The most important thing I look for in a hotel stay is the ability to get a good night sleep. These guys unfortunately did not deliver. Thank you for your honest review regarding your recent stay with us. While we certainly appreciate the feedback, we are quite disheartened to hear about your unfortunate experience, as it is not in line with the majority of our reviews. I will personally look into this. Also please note I was out of the office when you contacted the hotel. Our priority at this time is to remedy the unfortunate issues encountered and regain your confidence. Please email me your contact information directly at gm@bentleyhotelnyc.com. closest airport is LaGuardia Airport - 30 minutes away JFK is approx. 40 minutes. 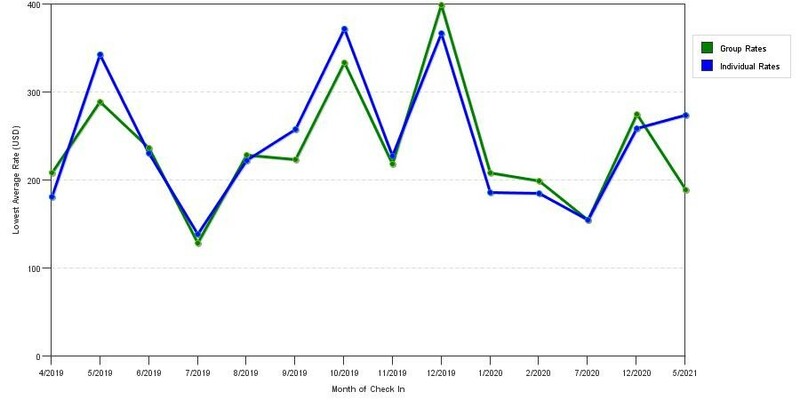 The graph above is trends of room rates for both our group prices and the lowest online individual prices our rate checker could find at the time the group offer was submitted. The best group discount displayed is 24.1% in the month of October 2018 and the highest average individual rate is $387 in the month of October 2018. This chart will show past seasonality and also project future months. If you are flexible with dates, you may want to consider staying at Bentley Hotel in a month when rates are lower.